Zamora is referred to in many places as a Romanesque Museum because of its huge number (twenty four) of 12th and 13th century churches, all arranged, with rather monumental effect, in the casco historico, or old town. Beyond its beautiful architecture Zamora is also well known for its cuisine. Local specialities include cheese - especially with ewe’s milk - and Toro wine, as well as Fuentesauco’s famous chickpeas, and there’s a great weekly market held every Tuesday morning. Many of the best places to stay in Zamora are within, or close to the casco historico. As the city with the most Romanesque churches in Europe, there is plenty to explore. Two of the best being the Cathedral and the Church of Santa María Magdalena. There are more than just medieval churches though, Zamora also has a wonderful museum of the Semana Santa processions which take place in this region. Marvel at the beautiful city walls that date back to the 11th century. Zamora is close by to the Duero river, just before it reaches the Portuguese border, so you can easily take a day trip on a cruise boat into Portugal as well. Our pick of the best places to stay in Zamora will satisfy all tastes, whether you're looking for period charm or a sleek modern property. The Parador de Zamora is a beautiful 15th century Renaissance palace converted into a 52 room hotel. The interiors are still medieval in places, with stone floors and long galleries, and the rooms are decorated with tapestries, chandeliers and have four-poster beds. There’s also a pool and lovely large gardens. The Valbusenda Hotel Bodega & Spa is a superb five-star hotel with 35 plush rooms overlooking the hotel’s own vineyards and surrounding countryside. There’s an extensive spa menu and lots of opportunities for walkers. The nearest airport to Zamora is Salamanca (58 miles). 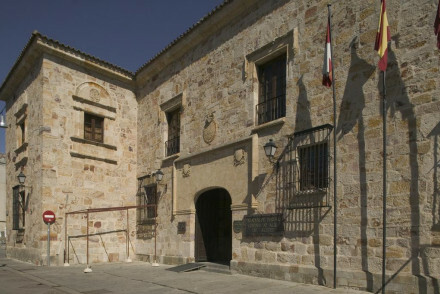 The best time to visit Zamora is either from May to June or September to October. In the high summer, temperatures are very hot. Browse through our list of all the best places to stay in Zamora. Expand your search to include all the best places to stay in Castile-León. A beautiful 15th century Renaissance palace with medieval interiors. Bedrooms and suites have tapestries, four poster beds, chandeliers, stone floors, galleries. Elegance and romance throughout. Excellent restaurant serving local cuisine, lovely gardens, and large pool. Perfect for local exploring. Sights nearby - Puente de Piedra, Santiago del Burgo, Zamora Cathedral. Local markets - Abastos Market.